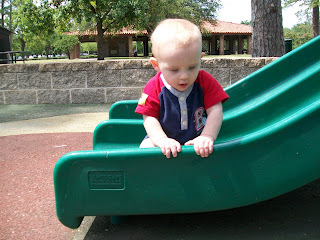 After our awesome trip to the Houston Children's Museum, we stopped to play at a nearby park. We parked at the zoo and followed the trails around the lake to the park - very scenic and nice. 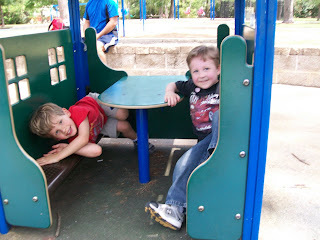 And all the boys had a great time playing on the playgrounds. 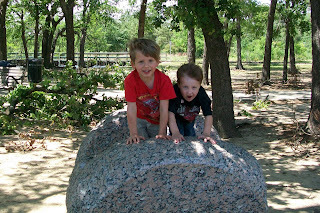 Dawson and Seth climbing and playing on a cool rock along the trail. 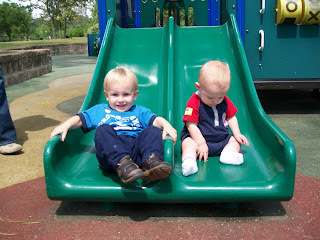 Cy and Brady on the slide at the small playground (perfect for little ones). 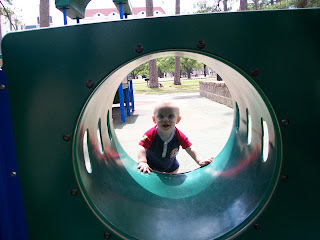 Brady peering over the side of the slide. Looking into the tunnel. He really has a great time crawling through tunnels. 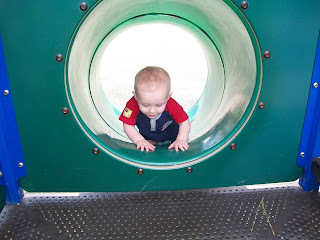 Crawling up the tiny tunnel slide. Dawson and Seth hiding and waiting for Cy to find them, at which point they would scream, run away, hide somewhere else, and wait for Cy to find them again.